If you think that focusing on money and sales is the only thing you need to do as an entrepreneur, you aren’t setting yourself up for true success. It started when I was in my twenties, researching online to see what opportunities were out there to make a living. Anything that I found out, I tried — banner ads, affiliate marketing, eBay, dropshipping, you name it. Not to mention the more underhand methods that we’d call blackhat today. Having made it to where I am today through managing my own online businesses, I became aware of just how many other elements contribute to the success of a business. What I learned over those years is that focusing on the metrics, strategy and marketing of your business is only one aspect of what it takes to succeed. The others are listed here — lessons I’ve learned through experience and failures, that have truly paved my way to success. A mistake I made was trying to wear all the hats in the company. Yep, I was the technician, manager, customer support rep, CEO, CFO, and every other role you can think of. I learned that having an expertise you love, and continually building on it will always be more valuable than trying to work on your weaknesses. I remember, for the longest time I was doing all the bookkeeping of my businesses. Even though it would only take me a couple of hours to complete each quarter of a year, just the thought of doing it dragged me down and demotivated me the rest of the day. Having the humility to recognize where a job could be done better by someone other than you is incredibly important. What’s more, it will only add value to your business if you are consistently getting the right people for every facet of your business. Making money is always cited as the goal of entrepreneurship, but what differentiates entrepreneurs is their higher purpose. Whether it’s charitable, for supporting your family, or for helping other people get their dreams off the ground, you will find so much more motivation in knowing why you’re doing what you’re doing. 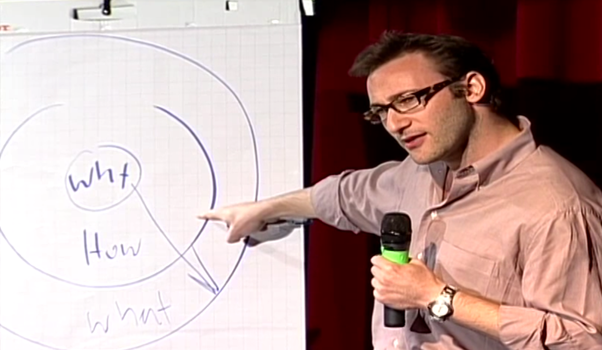 Simon Sinek is well-known for his book “Start With Why”. A book I highly recommend you read or you can watch his Ted Talk here. Simon says most businesses start from the outside in rather than the inside out. He calls this the Golden Circle. It’s made up of three factors — the What, How and Why. Most businesses know “what” they are selling and “how” it’s different to their competitors but don’t know why they’re doing it. The “why” is the purpose, the belief, the reason why anyone should care. “People don’t buy what you do, they buy why you do it.” — Simon Sinek. It seems like a smart business decision to try and get as many customers as possible by targeting a broader market but the problem with that is it will only make your marketing message vague and unclear. Unless you have a massive marketing budget, to stand out and be the go-to brand or business in your industry, you need to be a big fish in a small pond versus a small fish in a big pond. Niche down and specialize in your field rather than trying to target a broad market. If you’re serving “everyone” then you’re serving no one. If you go to the supermarket to get ingredients for dinner without knowing what you’re cooking, you’re unlikely to make a good meal. Your goal is too vague, and the actions you take to achieve it are at best inefficient, at worst sending you backwards. Always lay out exactly what you want to achieve before taking a single step further. As entrepreneurs, it’s natural to want to implement all your great ideas, but it can go against you. The mistake that I made in the past was that I worked on so many things at once. As a result, I spread my focus too thin, when instead I should have given 100 percent of my attention to just one thing. From birth, we are hardwired to respond to routine. When working for yourself, implement working hours that suit your needs, and stick to them. My work days are Mondays to Thursdays. Everyone knows it. My wife knows it. My friends know it. When you block off your time and let people know, they’ll respect it. It’s very tempting to just pay yourself a nice salary so you can go on vacation, buy a fancy watch or buy a new car. This is such a missed opportunity for growth in your business. Reinvesting the money back into your business will propel your company’s growth, whether it’s put into ad campaigns, resources, new staff or product development. Your money will go much further in the long run if it is working towards the growth of your business in the beginning. The most successful businesses in the world have systems and procedures in place to streamline their business. Take McDonald’s for example. No matter where in the world you go, the service and food is almost always consistently the same. That’s because they have a procedure and system that they follow. You may be small now, but thinking big is an important shift in perspective. Systems and procedures underpin every successful company. My magic rule is this: if you’re doing a task more than once, then it should be delegated. I almost quit on my dreams as an entrepreneur. I spent hours creating my website, developing a product that I thought my audience wanted, learned everything I had to learn about using Facebook Ads, Google AdWords, and approached partners to promote my product. In the end, I lost more money than I made. That’s the thing about a business. You have to put in all the work first with no guarantee that you’ll get any results at all. People tend to notice the so-called “overnight successes”. Usually, they don’t see the amount of work that was put in behind the scenes. When I was trying to make it online, I would stay up until 4 AM in the morning, reading, researching, testing, creating, and doing everything I could to prove to non-believers and naysayers that making money online was possible. Ultimately, it wasn’t the need to prove myself to others, but a single trait that helped me succeed: persistence. Persistence is having a “no giving up” attitude, no matter what. The world is continually changing — be open to change or you risk getting left behind. This means investing time in studying trends and innovations, too. Nothing will make adapting harder than lacking the knowledge you need to do so. The reason you succeed is because you’re working towards a goal. Starting out, when I reached mine, I often made the mistake of sitting back and becoming complacent only to realize that without keeping the gears in motion, your business suffers. Always have something new to aim for once you reach your current goal. Most self-starters and entrepreneurs fear failure but if you look at it from a a different perspective, you’ll learn to embrace it. Behind every failure there are important lessons to be learned. It’s those lessons that’ll help motivate, empower and make you wiser than you were yesterday. Stepping away from my desk has led to me coming up with some of my best ideas. Treat your breaks as actual breaks, not interruptions. Your mind will start to form incredible connections while it rests. You’ve probably heard people say a thousand times that success isn’t overnight. And it’s true — it took me over five years to make a full-time living from my online business. What makes it so hard is that you truly don’t know when you will get to the point you want to be at, which is why that patience is so important. Starting out, there is a good chance you’ll be your only colleague. Take some time to look at your strengths and weaknesses, how you relate to others, and what elements you need to work on if you’re going to go from solopreneur to leading a company one day. Is your personality fun, witty and casual or are you direct, blunt and professional? You need to know yourself so that you know what you stand for and ultimately be a confident leader. There are people out there who are already in the position you want to be in the future. So many of them are committed to giving to their followers the tools they need to achieve the same success they have. Choose three people whose success you want to model. What has contributed to my success is that I watched what my mentors were doing rather than what they were saying. Your mind is like a computer. If you don’t upgrade your mind then it will go out of date. The moment I stopped reading books and learning from others is when my business stagnated. The truth is, I thought I knew it all after having run my online business for eight years. Businesses can and do flourish with resources no greater than what exists in your own head. Aim to constantly expand on your knowledge — it’s the most valuable contributor to your company. You’re bound to encounter your own set of hurdles on your personal entrepreneurial journey, but these are lessons that really shaped my path to success. You can come back to this list every time you face a challenge — but you’re sure to find your own lesson in every one of them, too. Want To Discover My 5 Step Guide To Developing An Entrepreneurial Mindset? Copyright © 2018 AureliusTjin.com. All Rights Reserved.